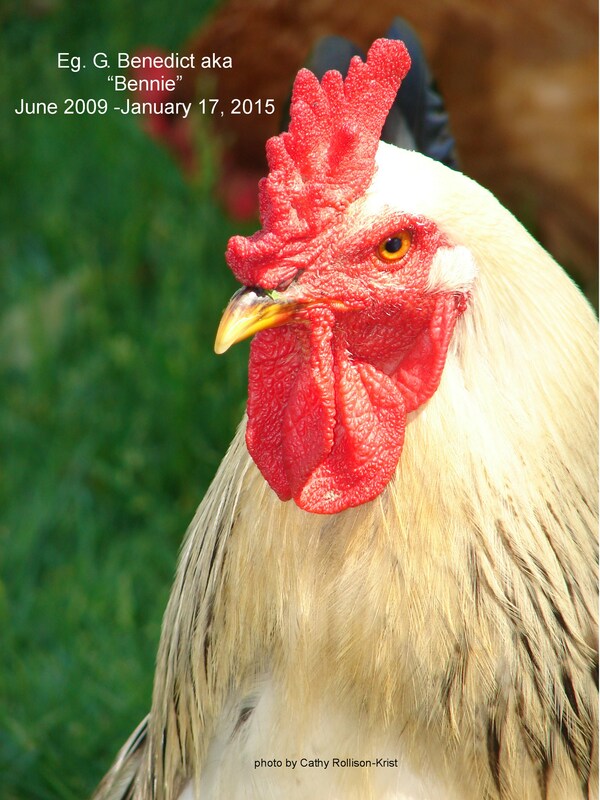 It is a sad time here at Carousel Watergardens Farm, our dear sweet senior Brahma rooster Bennie aka Eg. G. Benedict passed away Saturday evening. 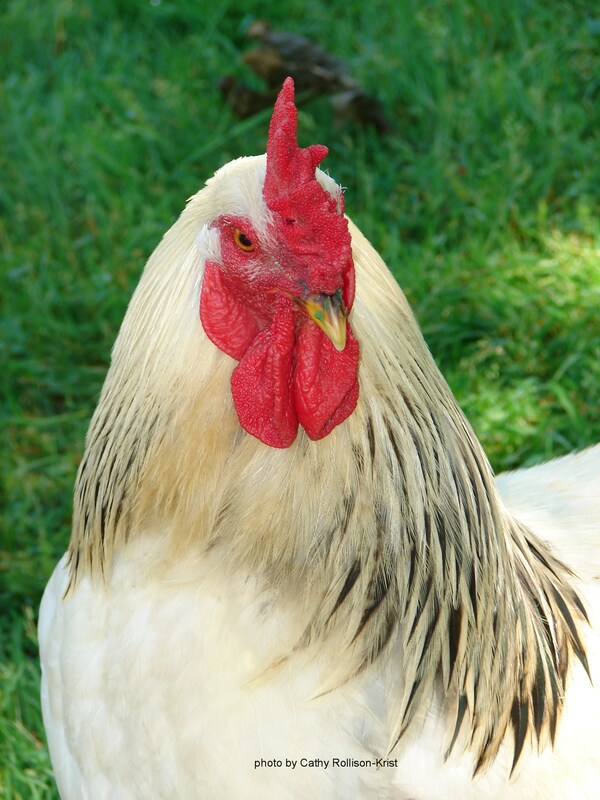 He has been the sweetest rooster, all the girls love him. 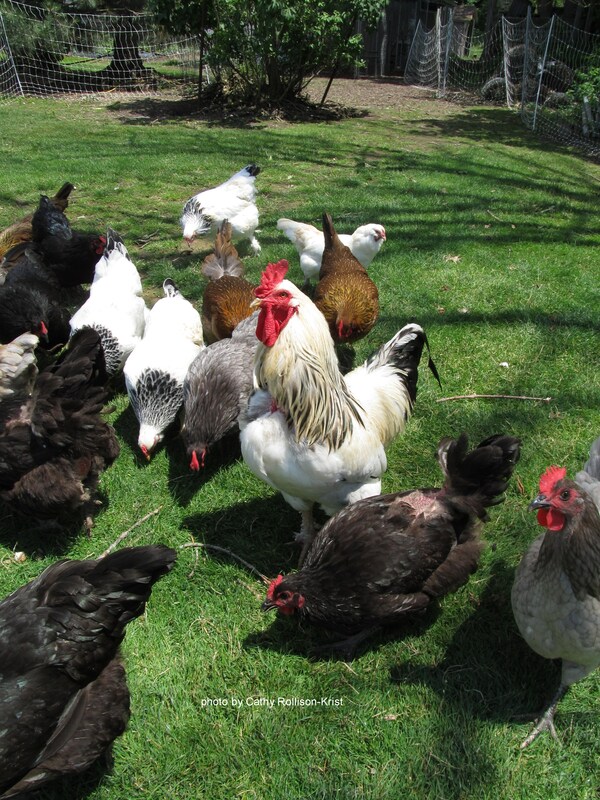 Much to their dismay even some of the other rooster’s girls fly their coops to get to Bennie and spend a day or two with him. I gave up catching the ladies and putting them back in their respective pens & pastures with their guys. The ladies “fly the coop escapades” were all to frequent. Bennie loved all the ladies here and kept the peace between his ladies and the visiting girls. Bennie has been the best guardian on our farm, he sounded the bugle when any aerial nemesis comes around, and he would spot a stray dog 5 acres away and sound the alarm for all to take cover. He provided for his ladies well also. Bennie was always watching to see when we went to the fields to pick the harvest he would strut up and down the pasture fences watching with his keen eyes and if he caught the slightest glimpse of us chucking any vegetable, weed or fruit a melee of screams were emitted by him chastising us for tossing something he felt he should inspect so his ladies could eat it. After all these years Bennie never caught on (or maybe he did and was just giving a friendly reminder) that we were putting the culls in a muck bucket so we could divide it up between all the chickens. You couldn’t put anything over on Bennie. The guy knew his tomatoes and he knew what he and his girls liked. We grow conventional round red tomatoes for market and we grow heirlooms. Throw a round red tomato in his field and he would scream bloody murder and tell me up one side and down another as he insisted “stop holding out on me”. No this old boy only wanted heirloom tomatoes and only 2 of his favorite varieties. He was unmerciful with his screaming and pacing and rants until he got what he liked. Bennie taught us how to cut a zucchini and a squash along with watermelon and cucumbers. You couldn’t just throw them into his ladies. Oh no Bennie wouldn’t rest until you climbed over the fence picked it up and slit the vegetable or fruit lengthwise and laid them down end to end for he and his ladies. I am not sure what names we were called until we learned our culinary efficiency but I can just about bet he used a few four letter words in that vocabulary of his. Bennie was the first to come running when he saw me approaching or if I called “Bennie bennie bennnnie” very fast. Bennie enjoyed certain folks visiting him mainly he loved a Down syndrome boy who came to visit. One of the boys always wanted to see Bennies hens and Bennie. I would pick Bennie up something he tolerated but wasn’t fond of, and hold him while the boys made over him and stroked his long black & white neck feathers. He seemed to know that he needed to be still and quiet while this one boy stroked him and made over him. He just took it in stride. When Bennie was a young chick he was the first of the roosters in his group to feather out, the first to get his comb and the first to crow. He was a handsome fellow and even though he knew it, he never let it go to his head, unlike Butters, Sheldon, Clooney or Sammie their arrogance knows no bounds. When we arrived home later that day and unpacked the trailer of coolers, produce, maple & honey to put away. We went out to do chores, it wasn’t as warm up here in Marion as it had been in Columbus, we had a stiff NW wind and from the looks of all the pens the chickens hadn’t ventured out at all. When we went in the barn all was quiet no bugle from Bennie announcing our presence. His girls were huddled in small circles. Looking around at the other pens the other roosters were quiet standing peering out their doors with their girls huddled around. As Ben’s pen is the first door on the left as we enter we peered in and couldn’t see our boy. Upon entering his pen we didn’t see him so we went out around the North side of the barn to the pop door to see if he was outside and we possibly had missed seeing him. Bennie was nowhere to be seen. Back in the barn we went and entered Bennie’s pen again we searched the nest boxes, he wasn’t on his favorite perch and not in any of the huddles of girls. 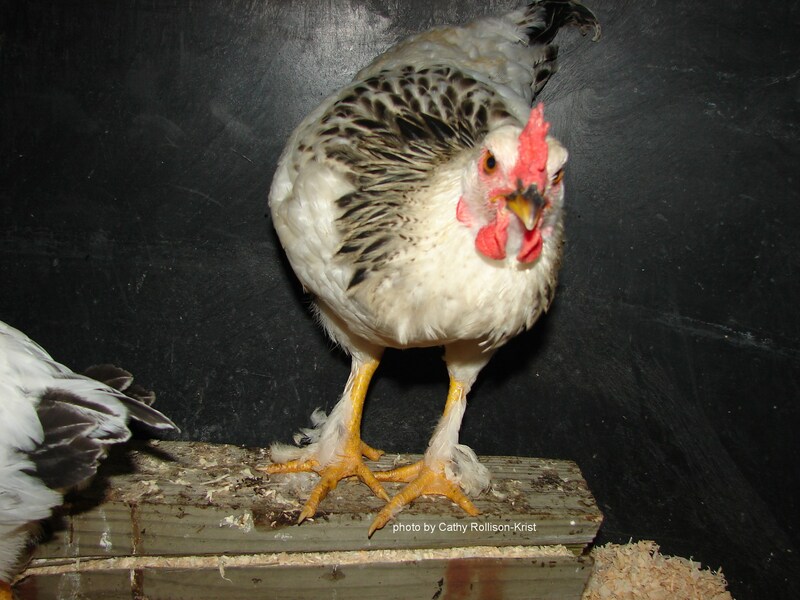 We looked under the platform that runs the length of their roosts and there in the corner lay Bennie. We reached back in for him but he didn’t move, we pulled him out from under the platform, a favorite place for all the birds for it is thick with pine chips and they love to dust bath under there. Bennie was stiff he had been gone awhile. He had simply laid down and passed away peacefully. That is how I hope all my animals are able to pass peacefully and in a loving clean environment. I will miss my sweet Bennie. The silence around here has been unbearable; his bright eyes will never greet me again I will miss his talks he had with me every day and his squawks to let him inspect the produce for suitability for his ladies. His girls are quiet no hustle bustle as their used to be. Even Bennies son Sunny aka “Sunny Side Up” is quiet along with his girls as they continue to peer through their door looking over at Bennie’s pen. I know my sweet Bennies soul is soaring as he watches from the heavens above. There is still a void in my heart but I was blessed to have this wonderful handsome rooster teach me a thing or two about life and a bit of culinary efficiency. RIP my Eg. G. Benedict my “Bennie”- June 2009-January 17, 2015.